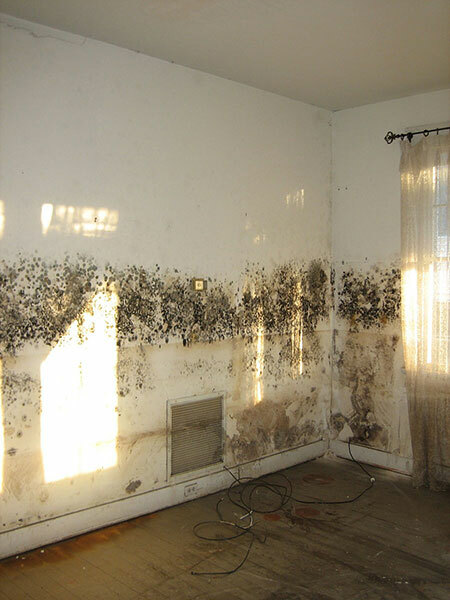 Odors, allergies, and health problems are all signs of mold damage in a home. Among home-related threats, mold is one of the most serious because it can directly affect something more valuable than the worth of any material possession: the health of you or your family. Above all, mold remediation is the proper way to stop the spread and remove the damage. To understand the issues poised by mold, we must take a look at how it forms. Furthermore, how to prevent mold, and how to deal with mold if it appears. Mesophilic mold spores exist almost everywhere. Therefore, making it impossible to remove all mold from a home or business. • Grows best in temperature range of 68º to 86º • However, certain molds will grow in much colder temperatures. • Mold spores are microscopic and float in the air, and may enter your home the outside. • Fungus feeds on organic materials, also known as cellulosic materials. • These spores thrive on moisture and can quickly grow when exposed to water. • Before mold remediation can begin, all water sources must be addressed. • When mold is present, there typically is a strong and musty odor like spoiled eggs. First, Source Identification:LBR technicians must identify moisture intrusion into the structure by using tools such as thermal imaging and moisture readers. After the source of the moisture must be addressed then the remediation can begin. Second, Containment: Technicians isolate the area of contamination to eliminate the spread of mold spores to other areas of the property. Third, Filtration: We then use HEPA air filters running continuously throughout the project. Mold spores, dust, MVOCs, and other airborne debris are sucked into the machine. Fourth, Removal and Cleanup: Contaminated building materials are removed or remediated according to mold remediation guidelines set by the IICRC. Finally, Replacement: LBR’s reconstruction team will repair or place damaged building material to its pre-loss condition.